We’re Good Earth Tea Co and we get tea because we love tea, we just do. Tea comforts us, gives us a lift, thrills us, drives us, and makes us want to share our passion with good people like you. That’s why we have one of the world’s top tea masters sourcing out leaves and ingredients from around the globe and right here at home. All to create unique, exotic and exciting blends. It’s a great day here at headquarters when we all get together with our tea master to sample these new blends, make suggestions to splendid them, and basically bond over tea all day. We’ve been at this for 40+ years, planting our roots in the 1970s with our original Sweet & Spicy Tea which went from a local prized to a country wide “tell my friends but don’t take mine” tea. 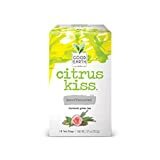 Good Earth now has teas that span all sorts of tea varietals, herbs, botanicals and flavors … naturally good things carefully chosen and masterfully blended together for a one-of-a-kind taste experience. 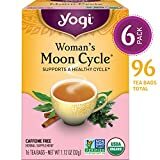 Embrace Harmony with Woman's Moon Cycle Yogi Woman’s Moon Cycle tea is purposefully formulated to help soothe the minor tensions and discomfort of your monthly cycle. We combine Raspberry Leaf, traditionally used for centuries to address common menstrual discomforts, and Chamomile, which has been used for centuries to help soothe the mind and body. Infuse harmony and comfort into the days of your monthly cycle with a calming cup of Yogi Woman's Moon Cycle tea. * *These statements have not been evaluated by the FDA. This product is not intended to diagnose, treat, cure, or prevent any disease. We’re Good Earth Tea Co and we get tea because we love tea, we just do. Tea comforts us, gives us a lift, thrills us, drives us, and makes us want to share our passion with good people like you. That’s why we have one of the world’s top tea masters sourcing out leaves and ingredients from around the globe and right here at home. All to create unique, exotic and exciting blends. It’s a great day here at headquarters when we all get together with our tea master to sample these new blends, make suggestions to adept them, and basically bond over tea all day. We’ve been at this for 40+ years, planting our roots in the 1970s with our original Sweet & Spicy Tea which went from a local beloved to a country wide “tell my friends but don’t take mine” tea. 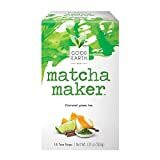 Good Earth now has teas that span all sorts of tea varietals, herbs, botanicals and flavors … naturally good things carefully chosen and masterfully blended together for a one-of-a-kind taste experience. Earthy, vanilla organic Rooibos and a sultry blend of spices come together from around the world in Numi's caffeine-free chai. Warmed by the South African sun, Rooibos is lauded for its high anti-oxidant properties. It is full-bodied like black tea, yet soothing any time of day. We've sourced the highest quality cloves, nutmeg, and cinnamon, mingling them with sweet Indian allspice and vivacious Chinese ginger. A kiss of cardamom unites this fabulous caffeine-free alternative to Numi's Golden Chai. Share in the savory warmth of Ruby Chai. For more information on Numi and our products, please visit our website at www.numitea.com or contact us at 866-972-6879 (Toll-Free). 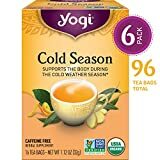 Mighty Leaf Tea White Orchard Tea Pouches - 6 per case.